The Internet of Things (IoT) promises to reshape entire industries. The business value can be profound—ranging from digitizing an organization’s internal operations and customer experience to unlocking disruptive new digital products and business models. McKinsey estimates that IoT could generate up to $11.1 trillion a year in economic value by 2025. Connected Products: Companies can engineer new IoT-enabled features and services into new connected products to differentiate and improve experiences. Connected Business Processes: They can use IoT to improve their operations with better, smarter information. There are many companies who are already taking advantage of the data explosion driven by IoT, using machine learning and predictive analytics to optimize, innovate and transform their business by building IoT applications, also known as Smart Apps. Airline – An equipment tracking app provides an airline’s engineers with a live view of the locations of each piece of maintenance equipment. By increasing the efficiency of engineers, this IoT application is not only generating significant cost savings and process improvements, but also impacting the customer experience in the end through more reliable, on-time flights. Pharmaceutical – A medication temperature monitoring app uses sensors to detect if the medication’s temperature has gone outside of the acceptable range and ensures medical supplies still meet quality standards upon delivery. The handling temperatures are medications, vaccines for examples, is critical to their effectiveness. IoT based smart applications can be used to not monitor that medications are kept within the proper handling temperature range, but also to remind patients when it is time to take their medication. Manufacturing – A lighting manufacturer for the horticultural industry built a Smart App that leverages IoT sensors and predictive analytics to perform predictive maintenance and optimize lighting, power consumption and plant photosynthesis. The IoT application transformed their business from a lighting systems manufacturer to a greenhouse optimization as-a-service business. Visit Our App Gallery for Live Examples of IoT Applications in Action, from Logistics to Home Care. Insurance – An insurance company offers policyholders discounts for wearing Internet-connected Fitbit wristbands. The fitness tracking service is part of the insurer’s Vitality program aimed at integrating wellness benefits with life insurance. Through this IoT application, this insurer is creating smart life insurance products and rewarding customers for their positive actions. Business Services – A facility services company uses their multi-device IoT software to enable support personnel to receive alerts about service issues and take immediate action. By aggregating data from thousands of sensors in devices like coffee machines, soap dispensers, paper towel dispensers and mouse traps rather than doing manual checks, the application has significantly cut costs and improved service levels. Media & Entertainment – An entertainment design and production firm uses sensors in turnstiles of venues to understand the foot traffic of people at events. Their IoT application visualizes the attendee traffic patterns in real time to help sponsors understand the best places to advertise, and to ensure the attendee count stays within the fire code compliance of the venue. What are Some Uses of IoT? • Monitor, track and secure data with blockchain and IBM Watson for asset management. • Plan and track elevator maintenance utilizing QR codes and usage sensors. • Time tracking projects, incorporating voice commands from Alexa. • Crop management solution that tracks and analyzes environmental conditions for agricultural companies. • Application that raises money for charity utilizing a video stream, online controls and Christmas lights. Internet of Things technology can include any sensor, electronics or software that is connected to the internet and can be utilized remotely and exchange data. Often the technology works together for enhanced functionality. What is a Platform for IoT? IoT applications typically incorporate a large amount of remotely accessed information made available through the internet. A platform for IoT simplifies the data access and aggregation of this data so that the app developer. 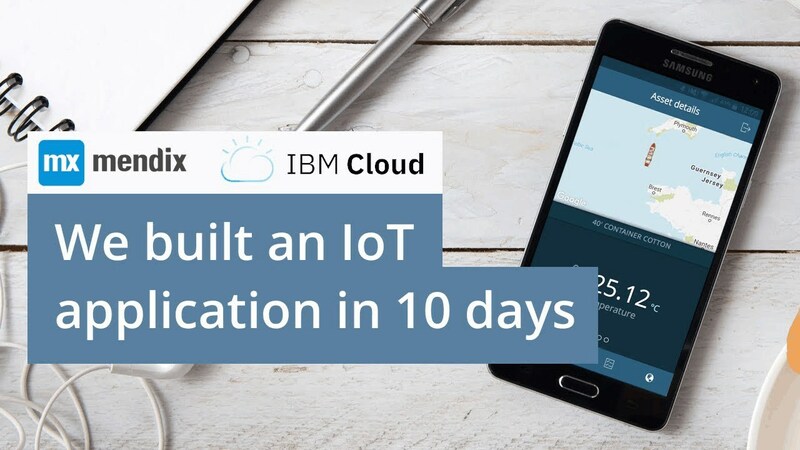 While most software development platforms can facilitate or host IoT functionality, Mendix’s low-code platform makes developing IoT enabled smart apps intuitive and accessible with little technical knowledge. The Internet of Things is an aggregation of internet enabled smart devices, sensors, databases and software that can be manipulated by scripts, applications and user interfaces across long distances. For example, a smart thermostat that is connected to the internet and can be controlled remotely by a phone application or an automated script. Who Came up With the Internet of Things? The concept of the Internet of Things is nearly as old as the internet itself with the first device coming online in 1982 at Carnegie Melon University. However, it was the co-founder of MIT’s Auto-ID Lab, Kevin Ashton who coined the term in 1999 in a presentation to P&G.